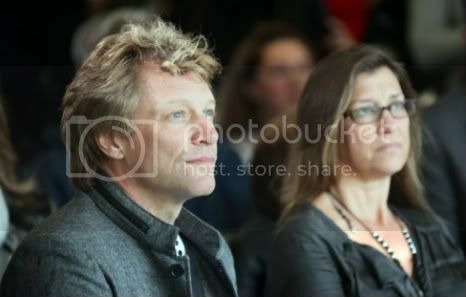 MD4-Jon Bon Jovi opens 'pay what you can' restaurant...Now how influential is that!? ~I remember someone here, a member of the forums, talking about what a huge Jon Bon Jovi fan she was; of course, so was I when I was a bit younger and that's how we discovered what all we had in common. So, it's no surprise when I read the following headline today, that I thought of her....."Jon Bon Jovi's charity restaurant opens in NJ"! I so hope she sees this!! "Stars often give back. But rocker Jon Bon Jovi has come up with an innovative twist. 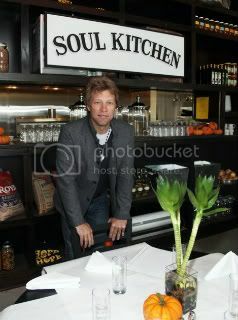 He and his wife, Dorothea, have opened The JBJ Soul Kitchen, a "pay-what-you-can" restaurant in Red Bank, N.J. The JBJ Soul Kitchen began serving meals in 2009, utilizing two different pilot locations and assessing the patrons' needs and response to the model, before renovating an old 1,100-square-foot auto-body shop as the Kitchen's new, permanent location. Entrees are upscale, including Rainbow beet salad, Garden State gumbo and cornmeal-crusted catfish, reports The Asbury Park Press. The concept: To provide gourmet-quality meals to the hungry while enabling them to volunteer on community projects in return. It's a soup kitchen, but not a typical one. Bon Jovi explained before the opening Wednesday that he hopes patrons will come and eat, but give something in return. Paying customers are encouraged to leave whatever they want in the envelopes on each table, where the menus never list a price. "If you can't afford to eat, you can bus tables, you can wait tables, you can work in the kitchen as a dishwasher or sous chef," he said. Or you can volunteer elsewhere and earn a certificate good for a meal at The Soul Kitchen. "If you come in and say, 'I'm hungry,' we'll feed you," Bon Jovi told AP. "But we're going to need you to do something. It's very important to what we're trying to achieve." ~Isn't Jon Bon Jovi's whole concept for his restaurant brilliant? Who woulda "thunk", as they say !? Regardless, it should have been thought of a lot earlier, especially when you consider how simple the concept and the idea really is. I say that this venture sets Bon Jovi apart from the other rockers who constantly talk about how terrible things are in the world, and who often can be found blaming everyone and their cat for all the world's deadly, dire issues, and demand from their pulpit, as 20's and 100's fall from their pockets by accident, that everyone else get up and do something about it because Bon Jovi actually put his money where his mouth is and took action and accomplished something great...something to help others. ~In closing, Jon Bon Jovi who holds the title of rock star, and maybe even music legend, now has another one to claim, that of an "influential person". ~This is seriously THE best comment I think I've ever received on one of my blogs! Thank you !